Six countries have recently been dedicated for missionary work﻿—Romania, Bulgaria, Swaziland, Lesotho, El Salvador, and Nicaragua. Legal recognition was also granted to the Church in Czechoslovakia. 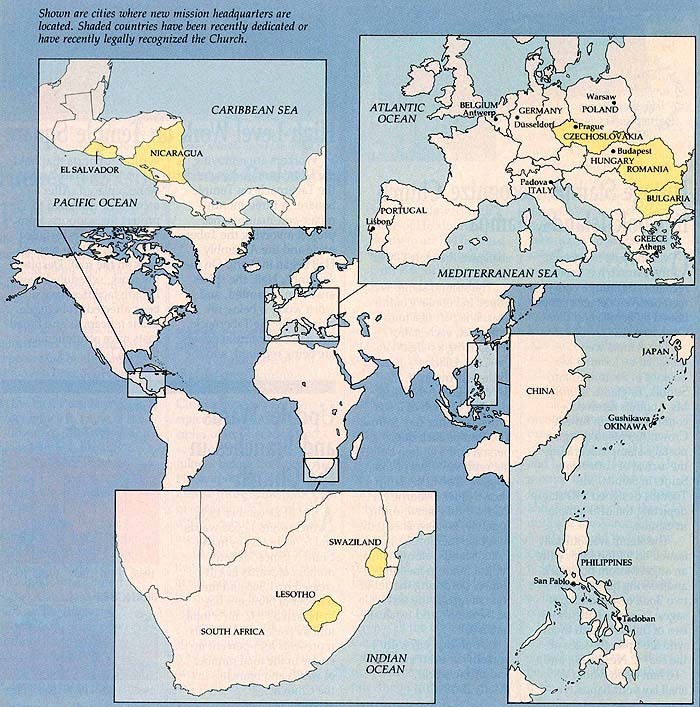 Shown are cities where new mission headquarters are located. [Italicized] countries have been recently dedicated or have recently legally recognized the Church. The Church’s application for legal recognition was approved by the Czech Republic on February 21. Elder Russell M. Nelson of the Quorum of the Twelve had visited Czechoslovakia on February 6 to discuss with government officials the Church’s application for recognition. He was accompanied by Elder Hans B. Ringger of the Seventy, President of the Church’s Europe Area. President Jiri Snederfler, district president in Czechoslovakia, accompanied the two General Authorities as they met with Josef Hromadka, the nation’s prime minister. “We received recognition, not as a new church, but as a church that was established in the country over sixty years ago. This means that our members will be able to worship in full dignity, as they once did,” Elder Nelson reported. Since the Church can now buy and sell property, leaders will look for a place in which members will be able to meet. Missionaries have also returned to Czechoslovakia, he said. Czechoslovakia was first dedicated for missionary work in 1929 by Elder John A. Widtsoe of the Quorum of the Twelve. Missionaries served there before and after World War II, but they were required to leave in 1950. There are now several branches in the country. During a visit to Romania on February 8 and 9, Elder Nelson dedicated that country at a spot in Cismigiu Park, in downtown Bucharest. He was accompanied by Elder Ringger. In meeting with government officials, they learned of Romania’s struggle to provide for a large number of orphans. As a result, the Church will send clothing and medical supplies to help. Elder Nelson also dedicated Bulgaria on February 13. While in Sofia, the nation’s capital, he and Elder Ringger met with the deputy minister of foreign affairs, Dr. Lubomir Popov, and with radio, television, and newspaper executives. Swaziland, an independent mountain kingdom bordered on three sides by South Africa, and by Mozambique on its eastern side, was dedicated on February 21 by Elder Neal A. Maxwell of the Quorum of the Twelve. He offered the dedicatory prayer on a hilltop overlooking Mbabane, the capital city. Elder Maxwell also dedicated Lesotho, an independent kingdom surrounded on all four sides by South Africa, on February 22 at a spot near Maseru, the capital city. “We are a small group here today, but we are being watched by a large group. Angels are aware of this moment,” he said in his remarks. El Salvador was also dedicated on April 7 at a private home overlooking the capital city of San Salvador. Elder Russell M. Nelson and Elder Richard G. Scott of the Quorum of the Twelve and thirty-nine local members and leaders were present. Nicaragua was dedicated by Elder Scott near Managua, the capital city, on April 9. He gave the dedicatory prayer in Spanish as Elder Nelson and twenty-six local members gathered to listen at a spot near a dormant crater in Masaya Volcano National Park. Central America was dedicated for missionary work in 1952, but El Salvador and Nicaragua had not been dedicated individually.